A little backstory, I love Gordon Ramsay. I’ve watched Hell’s Kitchen for years, as well as Master Chef (Master Chef Junior is one of my favorites and makes me feel like I have absolutely zero skills compared to these kids!). 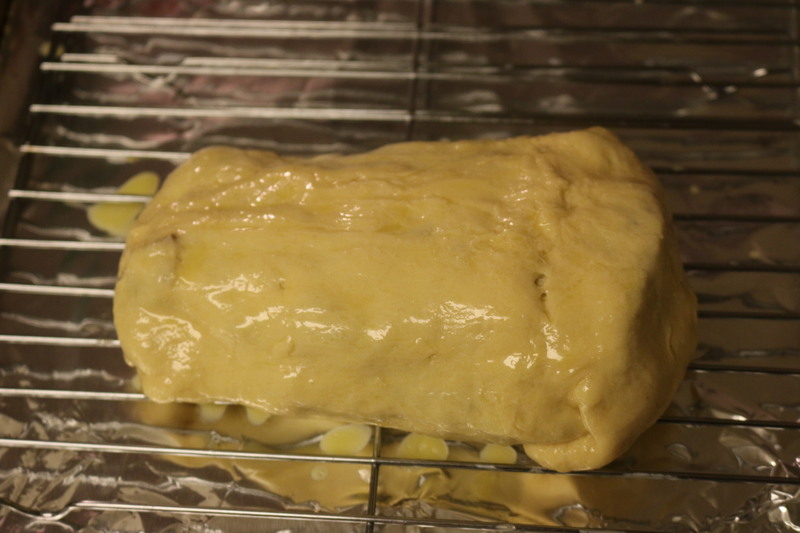 This was the dish he always made chefs prepare and he would always yell at for making it wrong—Beef Wellington. I knew I had to try and make it myself. To be honest, I didn’t even really know what I’d be making but it was going to happen. Well fast-forward to a few years later and here is my moment to finally make that prized dish. 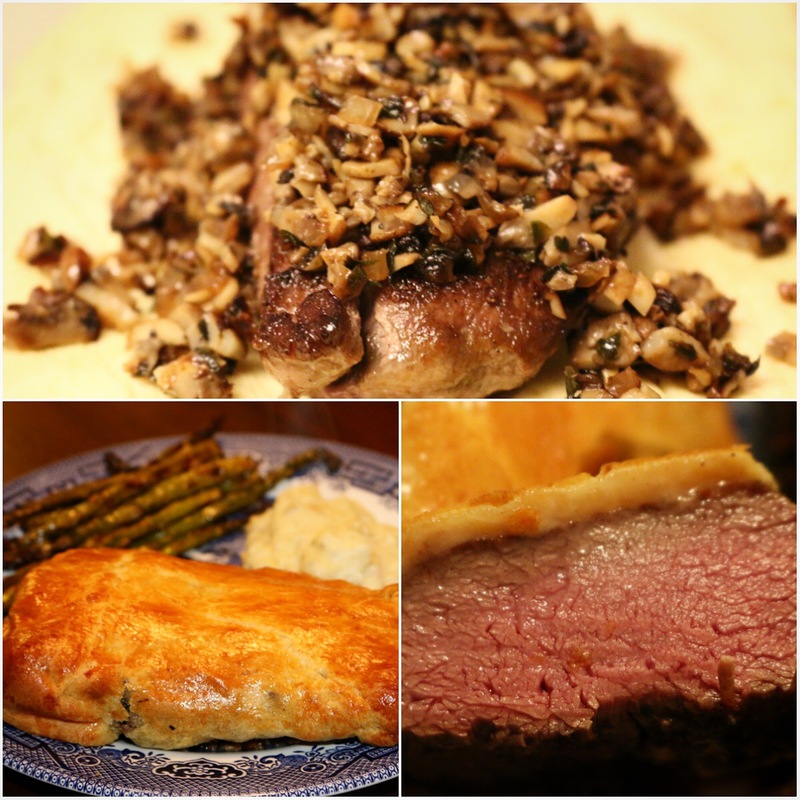 Here’s the recipe that I got my inspiration from, Beef Wellington – AllRecipes. 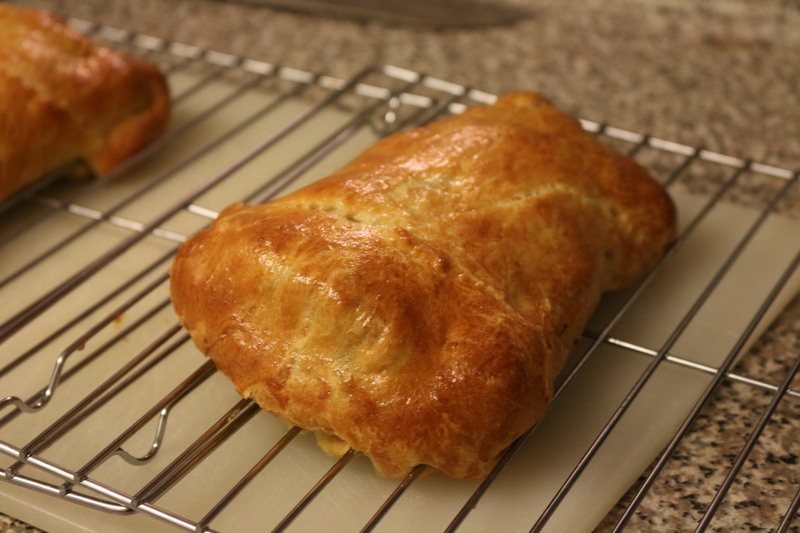 I know pâté is a key ingredient in Beef Wellington, but I didn’t really want to use that. So I found a recipe without it. Like all best-laid plans, I ran into problems. Read the grey box below for the story, it renewed my belief in the Christmas spirit. 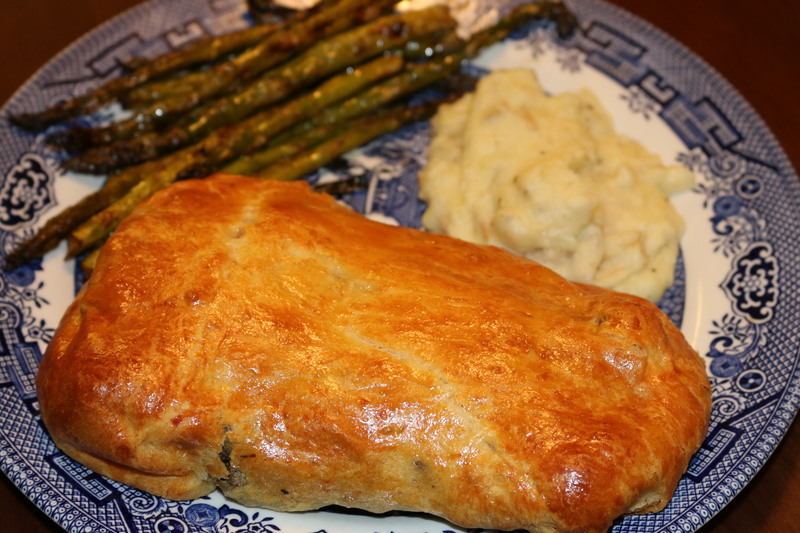 If you’re just hungry and want to see pictures galore of how I made this delicious Venison Wellington, skip to the bottom of the grey box! I shopped for the ingredients on December 23rd. Stores were packed full of last minute shoppers, like me, getting what they needed for Christmas dinner. I was down to my last ingredient—puff pastry—and made my way to the freezer aisle. I saw puff pastry rounds and looked at the wide, empty space next to them to see no puff pastry sheets left. Another woman with a full cart was standing near it. “Puff pastry?” she asked in a somewhat sympathetic tone. I sadly said, “Yes…” realizing the main ingredient was now nowhere to be found. “What do we do? Can we use these little rounds and make them into a sheet?” I asked. At that moment, another man came by with his full cart and realized our predicament. He explained no, we shouldn’t use the round puff pastries because it would be incredibly hard to even get two of them together. A conversation started of possible substitutes: pie crust, crescent rolls, filo dough? Pros and cons were discussed for each. Eventually I remembered coming past a recipe that used crescent rolls. I searched Google for puff pastry substitutes and crescent rolls came up. That was the answer… crescent rolls. Together, the woman and I made our way to the section with crescent rolls. We laughed about both making the same thing for the first time and both now missing the key ingredient. We were happy to not be in this alone figuring out what to do. We found the rolls, original or butter flake? The questions of what to do seemed endless. We both agreed butter flake sounded better and loaded up on cans. We had no idea how many we’d need, I grabbed two since I was only making a couple and she grabbed 6 for hers. We walked toward the check out lines and wished each other the best with making the Wellington and a Merry Christmas. It was a funny and random interaction that restored some of my faith in people during the holidays. Usually the store is the last place you’d want to be, with people too busy to get out of their own worlds. But three strangers came together to fix a problem, and quite frankly, save Christmas dinner. So, I ended up having no real recipe to follow after realizing there was no puff pastry left at the store. I saw that this recipe used crescent rolls, so I looked at both and kind of winged it. Below is what I did but lesson learned, buy your puff pastry early. Crescent rolls got the job done, but were not perfect by any means. Ok, you came to this post for a recipe, here it is! 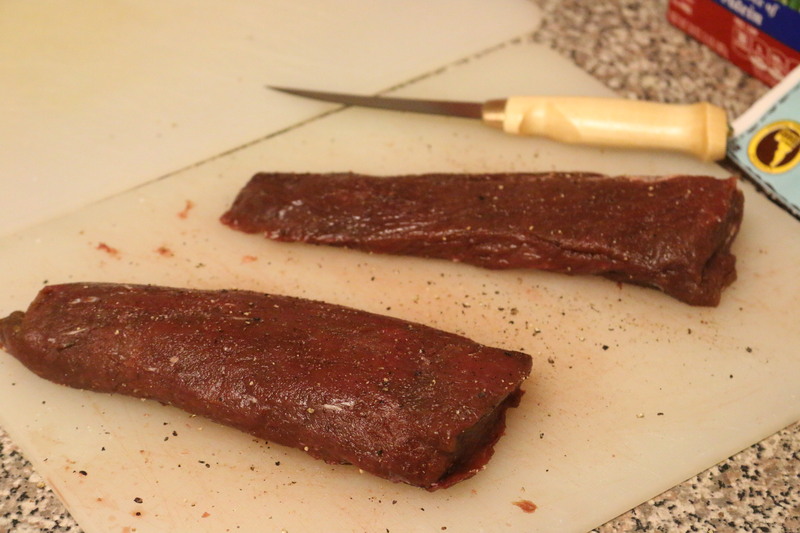 Start with whatever cut of venison you’d like to use. 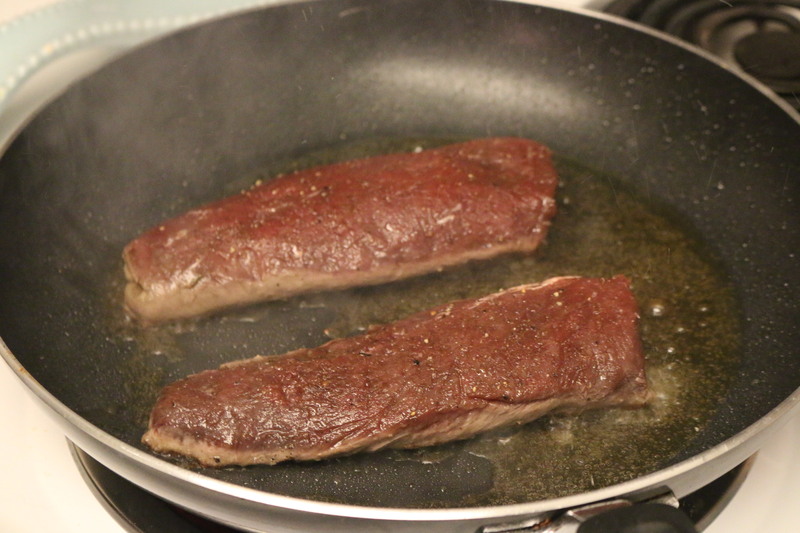 I used the backstrap, seasoned with a little salt and pepper. 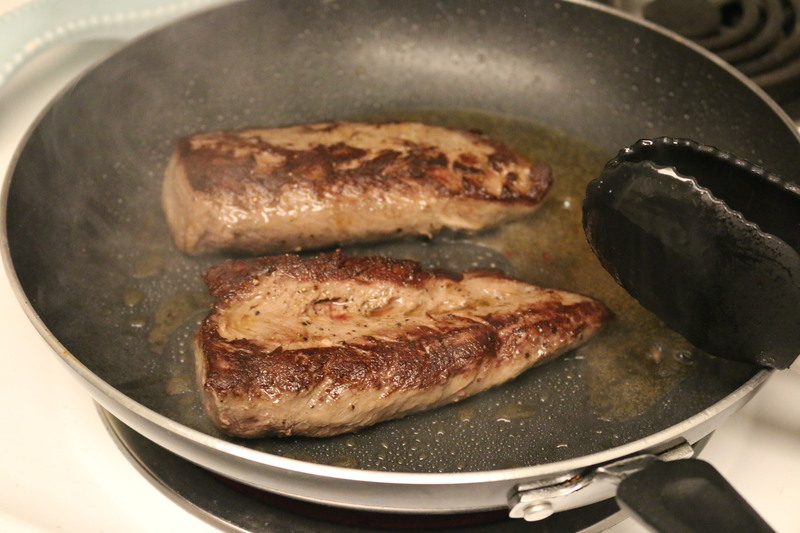 Heat oil over medium-high heat, then sear each side of your steak, about 3 minutes on each side. Once your steak has a nice sear, take it off the heat and let it cool. 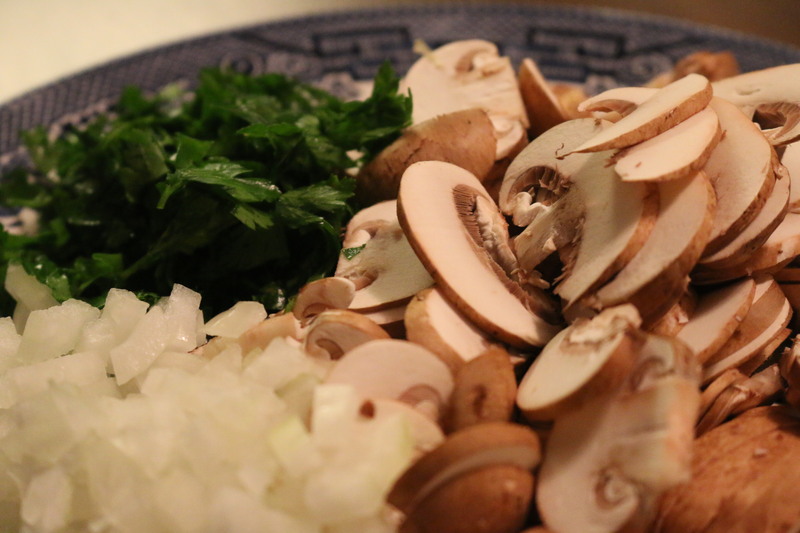 Next, chop your mushrooms, onion, and parsley. The recipe I followed said sliced mushrooms. Definitely dice them to a similar size as the onion. You’ll see below I had to do that later to get it to be more like a paste. 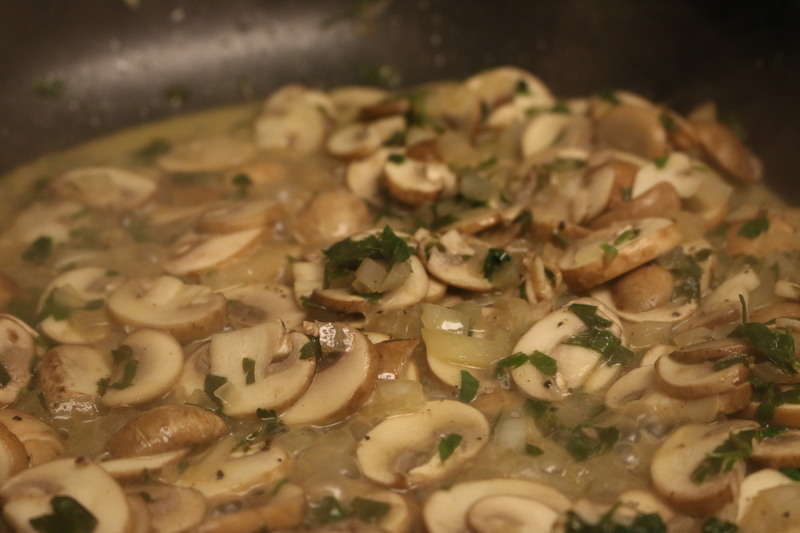 Sauté the mushrooms, onions, and parsley in the butter and sherry. Once everything is cooked down, remove from the heat. 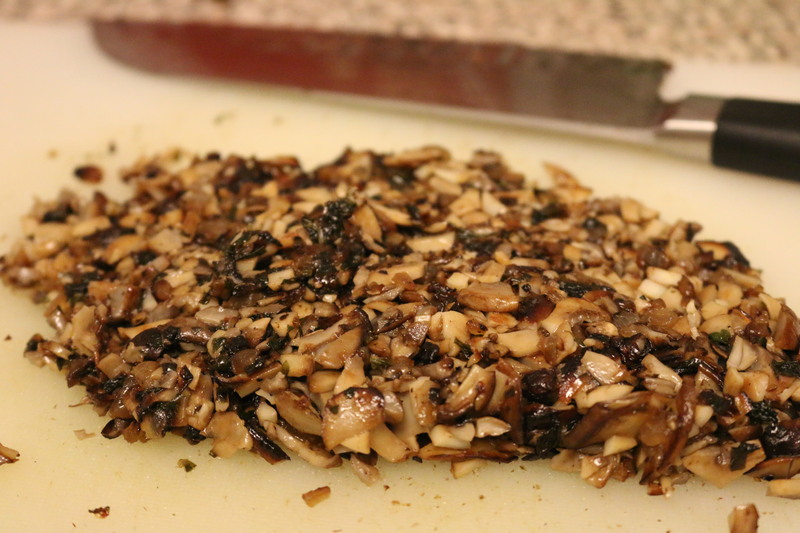 If you’ve diced your mushrooms, yours should resemble more a paste. If you didn’t like me, run your knife through the mixture a few times to mince it all together. Now it’s time to assemble the Venison Wellington! 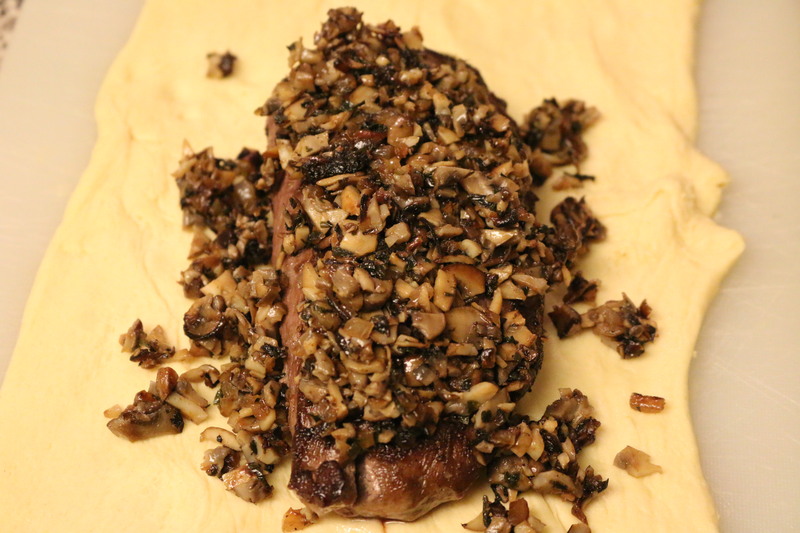 Lay out your crescent roll dough (hopefully puff pastry if you shopped ahead, unlike me) and place the steak on top. Make sure your steak has cooled before this step. 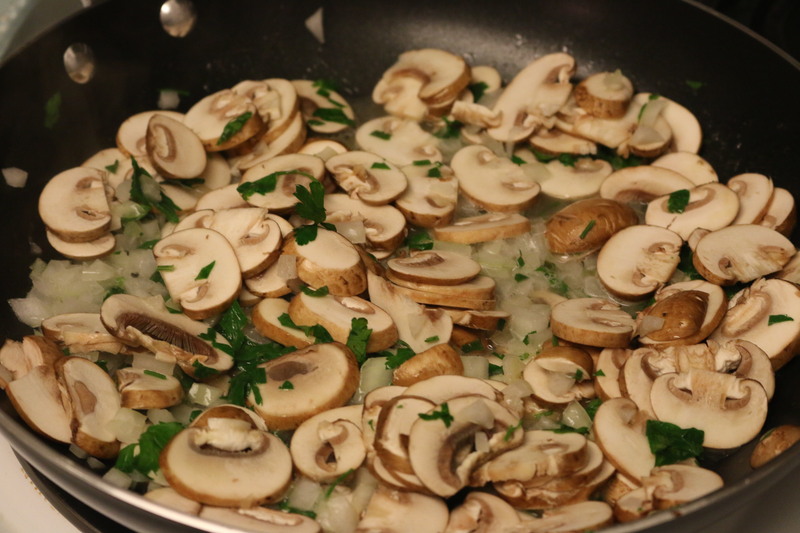 Add your mushroom, onion, and parsley mixture on top. How good does this look?! This meal is seriously one of the best things you’ll ever eat. 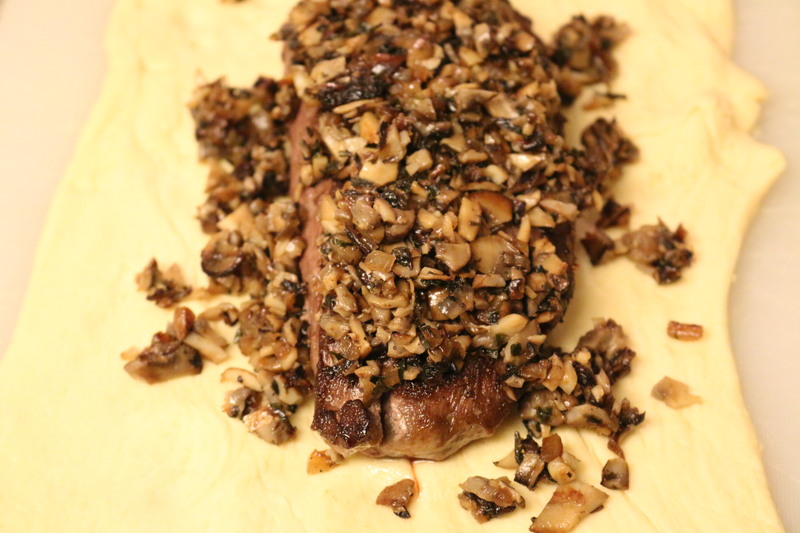 Fold the dough around your steak and make sure all the edges are sealed. If you’re excited like I was at this point to actually have it together, you can proudly say, “A little baby Wellington!” in a British accent. Or not, however you like to cook, I was definitely trying to channel Gordon Ramsay through this whole process, ha! 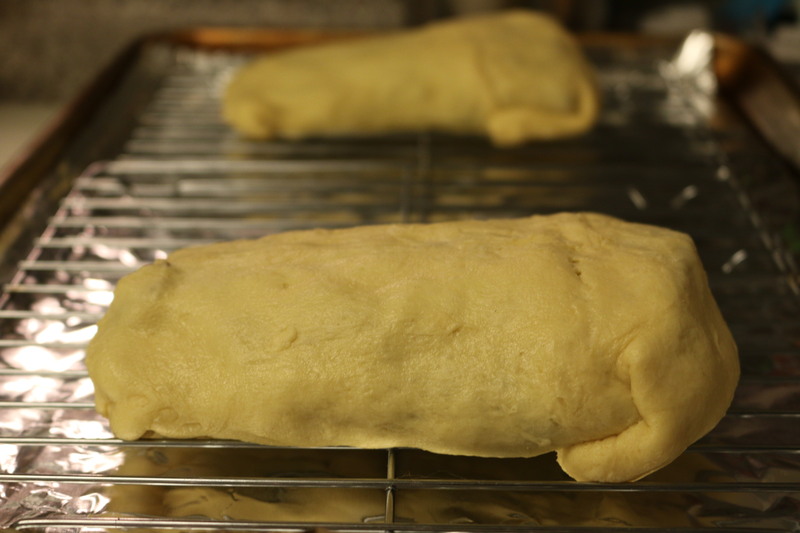 Next, brush an egg wash over the top of the dough. Beat an egg with a little water and you’ve got an egg wash.
It’s ready for the oven! Since I had crescent rolls and not puff pastry, I decided to preheat my oven to 375 degrees. 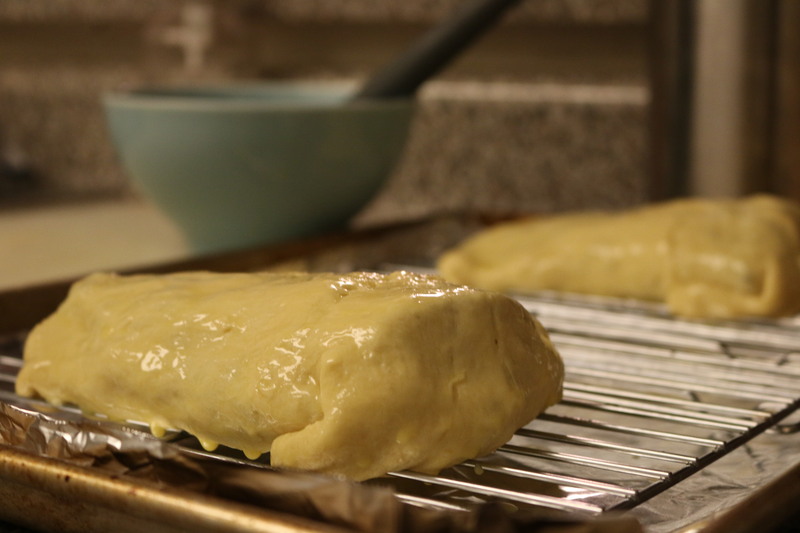 If you’re using the puff pastry, preheat your oven to 425 degrees. Place your baking sheet in the oven and let it cook. This is where I really started winging the recipe, I cooked mine for 25 minutes and then checked the temperature. The most important part of this recipe is to definitely use a meat thermometer. There’s really no way to know what’s going on inside of your dough. I love a medium-rare steak, so I took the steaks out of the oven when the internal temperature was 125 degrees. It will continue cooking a little bit as you let it rest outside of the oven. Violà! 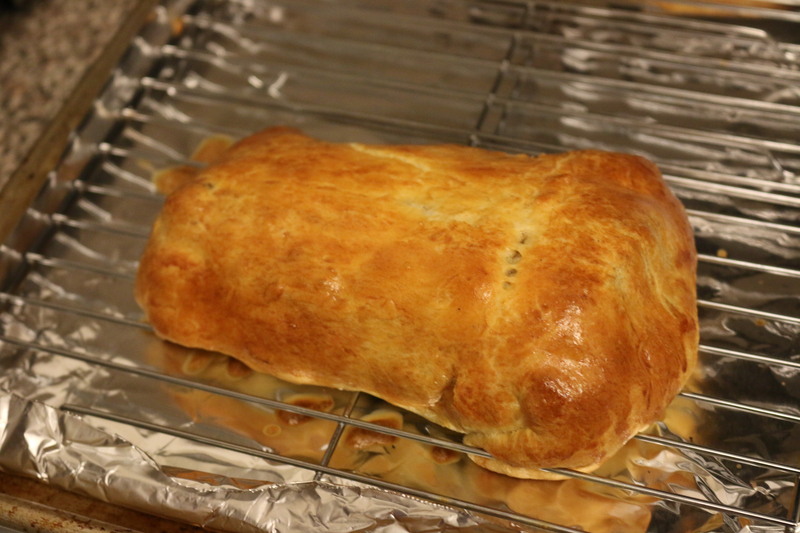 A Venison Wellington, right out of the oven. If you’ll notice, I cooked it on wire racks. All the recipes I read advised this so it didn’t get mushy on the bottom. However, use better wire racks than me. The dough on mine cooked between the racks. This is when the crescent dough was not the greatest choice. But it still looked delicious! Let your steaks cool for 10 minutes. Then serve with your favorite sides! I did roasted asparagus and green onions, with mashed potatoes. It’s now my new favorite Christmas dinner. Inside was a perfectly cooked, medium-rare steak! I didn’t take too many pictures because it was too delicious to not just eat. The crescent dough didn’t cook the greatest, so I can’t emphasize enough, get your ingredients early and buy the puff pastry! Still, this is one of the best things I’ve ever eaten. It’s one of those meals that sticks with you, and you find yourself thinking about weeks later. It was just that good. I recommend that everyone should try to make this with the meat of your choice. You won’t regret it! It’s far easier than it looks. Just trust yourself, trust your meat thermometer, and have fun in the kitchen. People can stress themselves out in the kitchen, especially around the holidays. But have fun and your food will turn out great. And if things aren’t going as planned, just improvise. 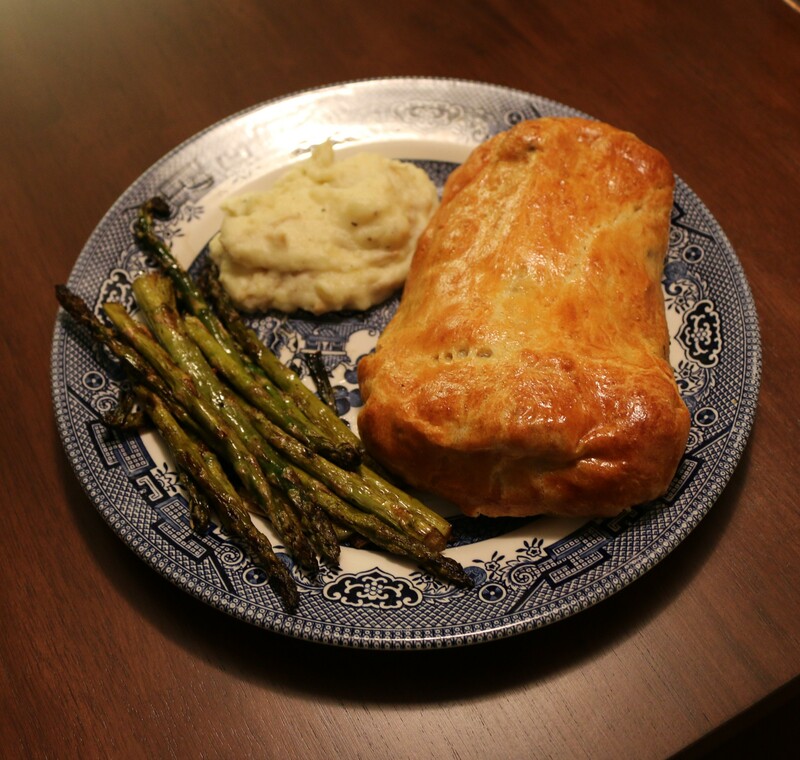 Since this meal isn’t leaving my mind, I’ll definitely be trying it again, but with puff pastry! I’ll update this post once I cook that and let you all know how it turns out. 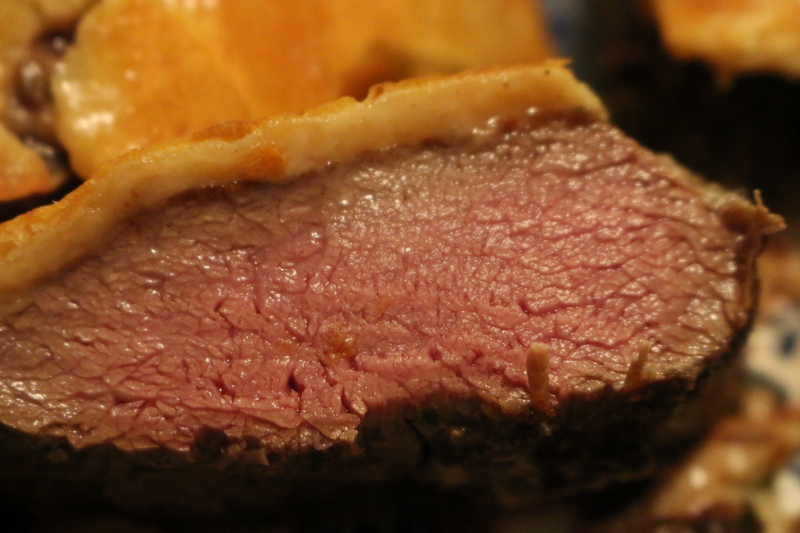 Have you cooked a Venison or Beef Wellington? How did yours turn out? Any crazy Christmas dinner stories from this year? Share in the comments below! And let me know if you try this dish! This looks great! Might have to try it some time. Thank you! You should definitely give it a try! It makes the top 5 of best things I’ve eaten. Just make sure to get that puff pastry! What an elegant dish! It would be perfect for any special occasion. 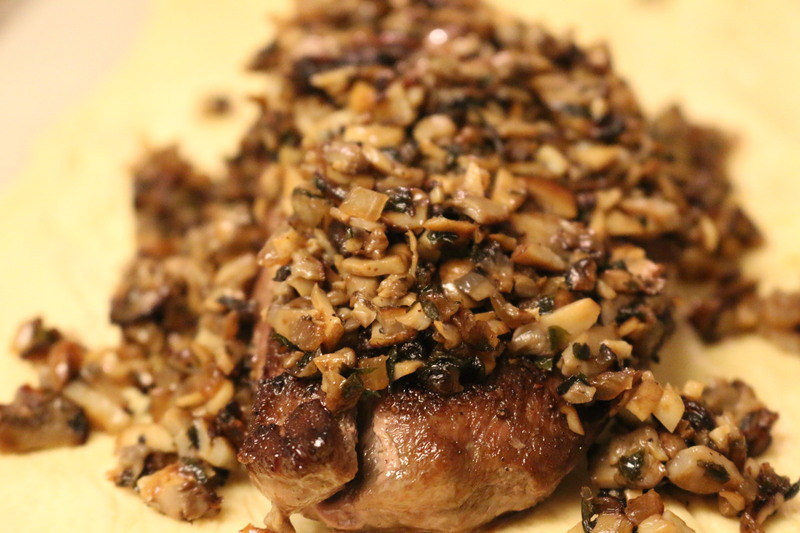 You had me at the sauteed mushrooms and onions! And crescent rolls, brilliant! I love the story about you creating a bond in the grocery store. Stuff like that happens to me, too. It’s a story that will make you smile for years to come. Also, your photos were fabulous. Can’t wait for your next installment. Thank you so much! It really is great for any special occasion. 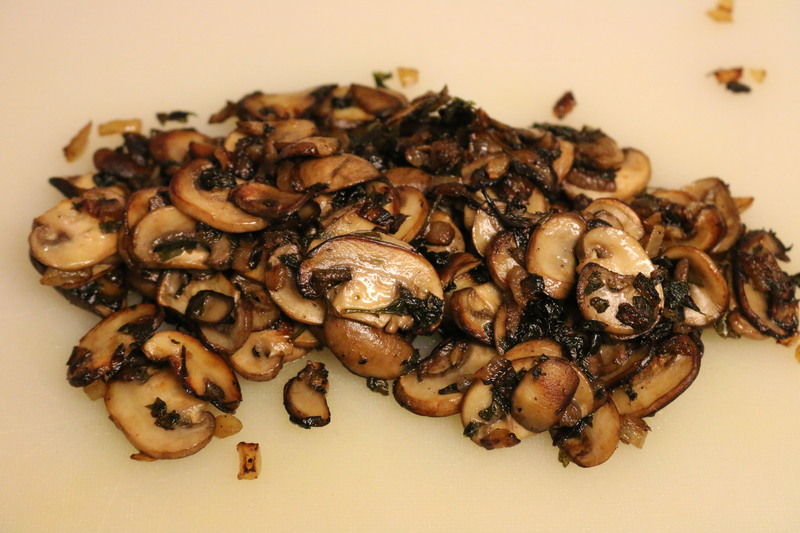 I’m so glad you love sautéed mushrooms and onions too! Can’t go wrong with those in any recipe. You’re so right that story will have me smiling for years, I really hope hers turned out well too! Thank you, going through all the pictures to make this post sure made me hungry again!